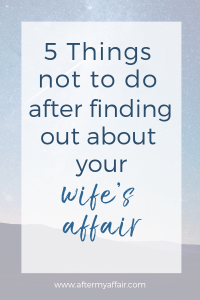 5 things not to do after your wife’s affair. and how to cope after you find out your wife was unfaithful, you can read it here. You might wonder if she’s even telling you the truth NOW. Is her affair really over? things for you to know NOT to do now. You’re not alone. There are many husbands in your same position right now. unfaithful wives. It’s a reality that many couples are dealing with right now. I can’t tell you to stay with your wife, or divorce her. Nobody can decide that but you. I do know that a lot of people give up before they should. Many marriages can be restored if they’re both willing to do the hard work in recovery. I just can tell you our story, and that we did survive my affair and our marriage is restored and better than it was, even before the affair. We appreciate each other so much more since we know we almost lost it. So…it IS possible for marriages to get through this hard stuff and be better. I’ll share some our personal stories in this post as an example. You can read our marriage story here. But I realize everyone’s situation is different. What I do want to help you with, is what NOT to do after finding out about your wife’s infidelity. We put together the top 5 things not to do, although there is honestly so many more. we learned the hard way, and it took much longer to heal. You’re pretty vulnerable right now and susceptible to a lot of poor judgement, because you’re hurting so much. 1. Don’t turn to self-medicating means to feel better. Sure, easy for me to say right? We all want to feel better, and in the short-term, it might help you forget a little. But it will eventually turn on you if you self-medicate in excess. I’m talking drinking alcohol, drugs, smoking pot etc…. You know whatever your vice is. 2. Don’t stalk her or the affair partner. Sure, you could follow her to see if she’s lying about where she’s going. You might feel justified in doing so, and honestly I wouldn’t blame you. But stalking, following, monitoring…will all just make YOU crazy in the end. 3. Don’t go injure or beat up the guy or slash his tires etc… you get the idea. It won’t help you or your kids if you end up in jail. Plus it will likely upset your wife further and drive her further away with sympathy for the other guy. Not good. You’ll not be any help to yourself or your kids or your job, if you get in trouble with the law right now. I’m not saying you’re not going to think it. Trust me, my husband did too. 4. Be aware of your own vulnerability right now to an affair. You might think “no way, I wouldn’t do that” but you are hurting and rejected right now. Prime situation for some kind of an affair. I actually had a suspicion my husband was meeting somebody from work when he said he was going somewhere else (because he’s a terrible liar and I know him so well). It was in the middle of all our stuff and he just wanted to ‘feel better’, so he started to confide in a long-term female friend/acquaintance from work. I guess you could say they had an emotional affair (just talking and texting) for a few months before I confronted them in the park talking that night. She was the type that preyed on guys like this. While talking with him, she was separated from her own husband and dating another! (yes, there really are women like that). That whole situation just complicated our own recovery in some ways. Later, and he felt dumb for confiding in her to begin with. Although you might feel that’s the last thing on your mind, just be aware of the incredible temptation and your vulnerability right now. 5. Don’t make any huge decisions for awhile. Whether they are financial, moving, divorcing or purchasing decisions. Your mind is not clear right now. Any big decisions you make right now is being clouded by your pain, your reasoning isn’t clear, and you will likely regret major decisions made during this time. For example: My husband bought a truck shortly after D-Day. He felt justified because he was driving a crappy car and he wanted to “feel better” and do something just for him. $30,000 later and he drove away with a brand new truck we really couldn’t afford. Realizing his mistake a week later, he tried to return it to the dealer and they wouldn’t take it back (ugh), so he traded it in at a loss for a cheaper car. I know you feel there are a lot of decisions you should make right now after finding out about your wife’s affair. You might think you should quickly divorce your wife because you are hurt (rightfully so), and you can’t imagine staying in a marriage with her after finding out she’s cheated on you. I would gently advise you to slow down. You can decide to divorce her later. There’s time. But what you don’t want to do is make that decision right now and realize later that you both didn’t do everything you could have done to save your marriage. Especially if you have kiddos involved. Do everything you can now to see if the marriage can be saved so you’ll always know later you did all you could. Talk to her about your future together and see where she’s at with the marriage and if she’s willing to get help together. Self medicate too much. Numbing your feelings with alcohol or drugs is a short-term solution which really won’t help you in the long run if you keep turning to it for escape. Don’t stalk her or the other man. It won’t help anything and will just make you crazy inside trying to constantly figure out where she is. Don’t harm or injure the other man/affair partner, or his possessions. The last thing you need right now is getting in trouble with the law. I know you want to, but hold back. You’re the bigger man anyway. Be aware of your vulnerability to having an affair right now yourself, even an emotional one, after finding out about your wife’s affair. There are women who prey on hurting husbands and you really don’t need to complicate your life anymore than it is. Your not reasoning as clear as usual so your decision-making skills are off right now. Give yourself some time to heal first. What part of this post hit home for you? Is there anything you need to do, or undo, today? I care about what happens to you and your wife. I will pray for you if you reach out and let me and Contact me and let me know, or you can leave a comment I can post it here if you’d like. Remember, You will get through this! Top 5 things TO DO and how to cope after finding out about your wife’s affair. Also, did you see the letter written just for you, the betrayed husband? You can read it here. So there’s things to do and things not to do, as you just read. For more help and learning, read the post about how to forgive your spouse here. Or, What forgiveness is not, here. I wrote this post with that in mind…What do you want your life to be?